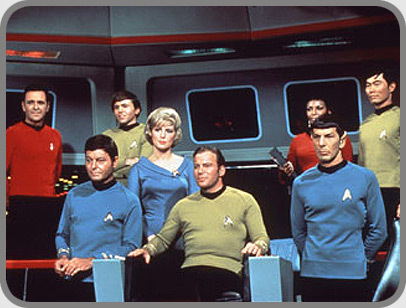 Star Trek is an American science fiction entertainment series and media franchise. The Star Trek fictional universe created by Gene Roddenberry is the setting of six television series including the original 1966 Star Trek, in addition to ten feature films (with an eleventh in post-production), dozens of computer and video games, hundreds of novels and fan stories, several fan-created video productions, as well as a themed attraction in Las Vegas. The original TV series alone is one of the biggest cult phenomena of modern times and has spawned many pop culture references. 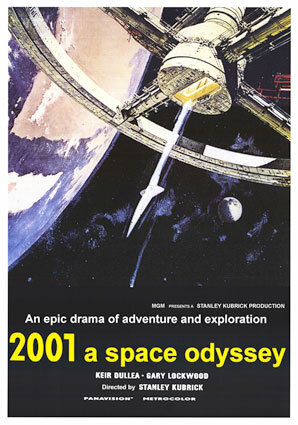 Artistically, 2001: A Space Odyssey was a radical departure from Kubrick's previous films. It contains only 45 minutes of dialogue, over a running time of over two and a half hours. The dialogue is largely superfluous to the images and music. Nevertheless it outlines the 'story' while presenting mankind as dissociated from itself and its surroundings. Clarke's characters function either as extensions of the story or else as anthropological archetypes. The story and plot are obscure for most of the film's duration and its ambiguous, perplexing ending continues to fascinate contemporary audiences and critics. After this film, Kubrick would never experiment so radically with special effects or narrative form, but the calculated ambiguity of his films remained a trademark for the rest of his career. 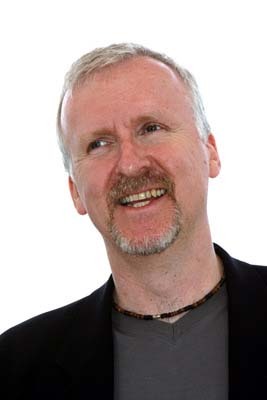 James Francis Cameron is an Academy Award-winning Canadian-American director, producer and screenwriter. He is noted for his action/science fiction films, which are often highly innovative and financially successful. Thematically, James Cameron's films generally explore the relationship between humanity and technology. Cameron created the Terminator franchise, serving as co-writer and director for The Terminator and Terminator 2: Judgment Day. Later, he wrote and directed the film Titanic, which earned 11 Academy Awards and grossed over US$1.8 billion worldwide. To date, his directorial efforts have grossed approximately US$3 billion, unadjusted for inflation. After a string of landmark feature films including The Terminator, Aliens, Terminator 2: Judgment Day, True Lies, The Abyss, and Titanic, Cameron turned his focus to documentary filmmaking and the co-development of the digital 3-D Fusion Camera System. 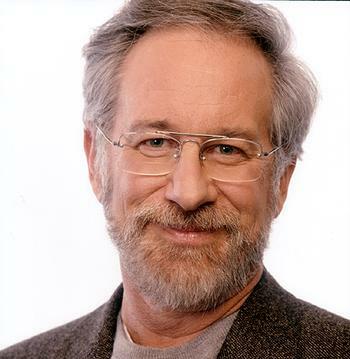 In a career that spans almost four decades, Spielberg's films have touched many themes and genres. 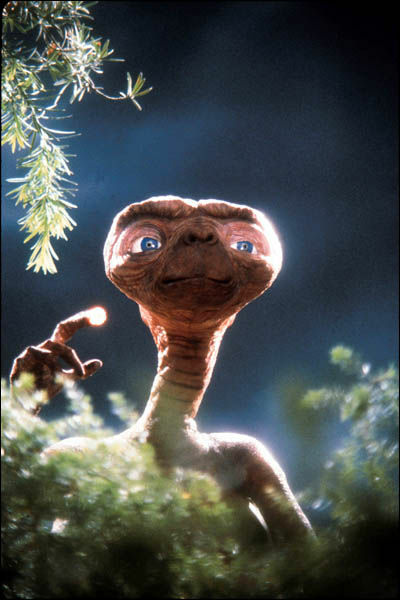 During the 1970s, 1980s, and 1990s, four of his films, Jaws, E.T. 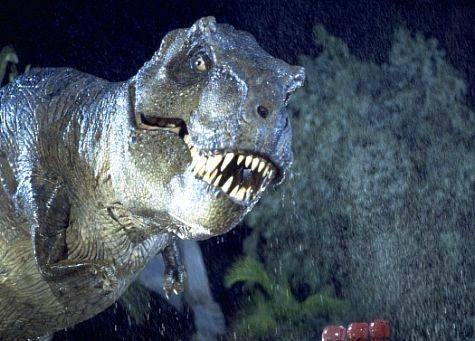 the Extra-Terrestrial, Raiders of the Lost Ark and Jurassic Park became the highest grossing films for their time. During his early years as a director, his sci-fi and adventure films were often seen as the archetype of modern Hollywood blockbuster filmmaking. In later years, his movies began addressing such historical issues as the Holocaust, slavery, war, and terrorism. Star Wars proved to be one of the most successful films of all time. During the filming of Star Wars, Lucas waived his up front fee as director and negotiated to own the licensing rights — rights which the studio thought were nearly worthless. This decision earned him hundreds of millions of dollars, as he was able to directly profit from all the licensed games, toys, and collectibles created for the franchise. Win an Exciting Club House Gravy Gift Pack! How did you celebrate your Christmas? I really had so much fun last night. It is our first time to have our Christmas Eve all together. Since this is a once in a lifetime opportunity, we all take the advantage to make our Christmas Eve very special. My mom cooks a lot of delectable dishes and shared all her unique and wonderful recipes to us. We have roasted Turkey which is traditionally served every Christmas Eve; we have spaghetti, steak, “bibingka” or rice rake, “queso de bola” and other sweet delicacies. My brothers and I were in charge in grilling the pork while my sister helps my mom in preparing the yummy salad. Of course, dry dishes like roasted turkey and pork chops will be boring to eat without our favorite Club House Gravy Mixes. With their easy-to-prepare Gravy mixes, your dry dishes will turn into flavorful and great tasting recipes. Club House Gravy can help you make great tasting gravy with no stress or fuss! Club House offers different gravy mixes for different dishes like pork and chicken. To make your gravy even more special, you can check some gravy tips video offered by Club House Chefs. You can view these videos by dropping by at Club House website. You can also be a part of Club House by signing up an account and become an active member. Members can have a chance to win an exciting “Club House Gravy Gift Pack”. You can also win fabulous prizes from Club House by simply sharing your spicy tips and idea in cooking. For more details, just visit Club House site to know more about their newsletter sign-up and contest entry. I wish we can do the same thing next year! Oh! I guess it’s not too late because we still have another day to celebrate which is the New Years Day! It would nice to start the year with a bang and with the Club House Gravy Mixes, we sure to have a very exciting celebration as it makes simple dishes into a yummy and great tasting recipes. Merry Christmas Everyone!!! Here i am having my last minute Gift Wrapping. May we all have the greatest Christmas! and don't ever forget to greet Jesus! 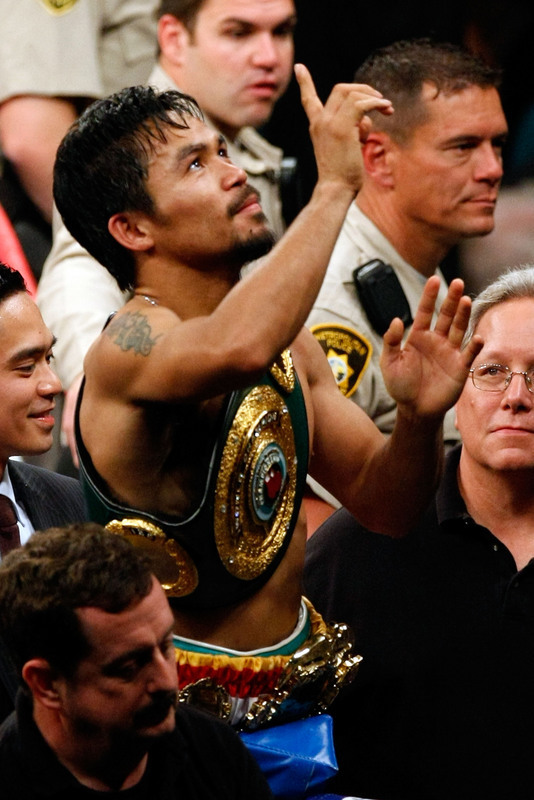 His the reason why we're celebrating this holiday! Don't forget to offer your prayers for him! 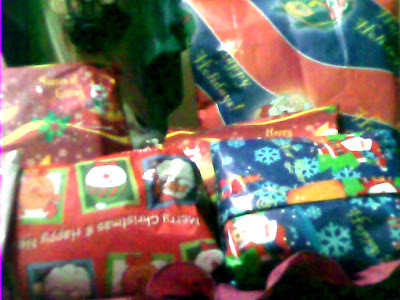 That's all for now, i have to finish all of these so i can distribute them tomorrow to all my nephews, niece and cousins! Technology evolves rapidly and we all know that! The evidences of these evolutions can be found in our cellular phones. From being a simple tool used for communication purposes, they are now used in many different and useful ways. Just like the newest phone model released by one of the top mobile phone manufacturers in the world ~ LG. The newest phone model released by LG is the “LG Chocolate Touch.” It is a multi-purpose mobile phone which is very ideal for all gadget lovers to minimize the space inside their pocket by removing those bulky gadgets like mp3, digital camera or your notebook and use LG Chocolate Touch instead. So what are the other purpose of this Chocolate Touch aside from basic calls and text messages? Say goodbye to your MP3 or your ipod because Lg Chocolate Touch has a music player with Dolby Mobile technology for crystal-clear sound quality. This is very much convenient to use knowing that you can play your favorite music in your phone without a separate mp3 on your pocket. Minimize the space in your bag by taking out the notebook and use the social media features of LG Chocolate touch. With their One-touch Social Network Message Key for easy use of Mobile Blogging( For Facebook, Twitter, Myspace and more), you’re always on the go! No more to Camera as LG Chocolate Touch includes a 3.2MP Camera/Recorder–quality pictures and videos, with image editor. In addition to that, Chocolate touch also offers a Sweet Visual Effects and features, including Rhythmical Beat that vibrates the handset to the beat of the music and their top-notch text, picture, video, and voice messaging features including Visual Voicemail. Amazing! Sometimes, it’s wonderful to embrace the benefits we get from these advance technology like the LG Chocolate touch. Christmas is one of the much awaited season of the year...but once you say Christmas ...what is the first thing that comes up in your mind? 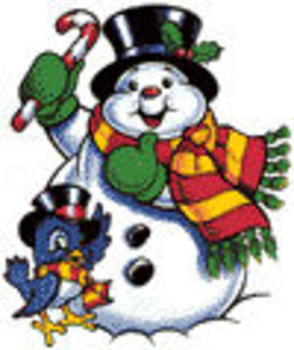 Christmas would not be completed for children without them receiving any Christmas gifts. This is the first thing that a child will think about when Christmas day comes. 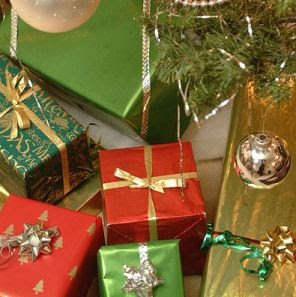 A Christmas tree is one of the most popular traditions associated with the celebration of Christmas. They make use of different colorful decorations and more. Have you been a good Child this year? well these would be the first question that a child could have to know if Santa will come by in his house to gave him a present. Santa is such a great influence to everyone...think santa and you will think Christmas as well. 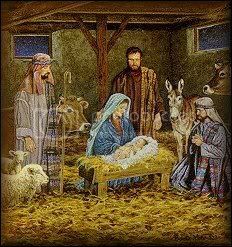 The reason why we are celebrating Christmas is to give tribute to a day when Jesus Christ, our savior, was born. I just love Bistro Crustini Products especially their famous Chicken Parmesan and their very tempting Philly Steak & Cheese. It is very ideal for a busy man like me knowing that Bistro Crustini offers a full menu of delicious, hot, crispy, cheesy, meaty, stuffed sandwiches baked warm and toasty out of the microwave in just two minutes. It is perfect to satisfy my late-night cravings! Guess what? Bistro Crustini is currently running a contest entitled “Bistro Game Day” which will give you a chance to win a VIP Trip for two to Las Vegas to watch the Big Game! This big and very exciting prize includes Airfare tickets for two, Five days, four nights at a deluxe hotel, Chauffeured limousine service, two tickets to a show with an amazing $1,500 CDN spending money! This is perfect for those football lovers who want to catch the game live! Aside from a chance to watch the Big Game, there will be three secondary prizes available to be won each consisting of a Sony Home Theater System that includes a 52" TV and home theatre sound system with an approximate retail value of $3,000.00 and 33 weekly prizes available to be won that consist of one Sony Digital Camera prize per week with an approximate retail value of $199.00 each. The Contest has a one entry per person policy and registration process is an instant win, meaning you’ll know right away if you’ve won! This is awesome! Unfortunately, the contest is not available in my area but I will surely inform all my relatives residing in Canada about this contest and I will encourage them to join! We're going to hav an Asian trip today as i will tour you to the "Land of the Morning Calm" ~ Korea. We will give focus to South Korea. Kimchi , also spelled gimchi, kimchee, or kim chee, is any one of numerous traditional Korean pickled dishes made of vegetables with varied seasonings. Its most common manifestation is the spicy baechu (cabbage) variety. Kimchi is the most common banchan, or side dish, in South Korea and many South Korean communities and locales. Kimchi is also a common ingredient and combined with other ingredients to make dishes such as kimchi stew and kimchi fried rice. Kimchi is very spicy and can also be exceptionally sweet. Kimchi is made of various vegetables and contains a high concentration of dietary fiber, while being low in calories. Lotte World is a recreation complex in Seoul, South Korea. It consists of a large indoor theme park, an outdoor amusement park, an island linked by monorail, shopping malls, a hotel, a Korean folk museum, sports facilities and movie theaters in one area. The Lotte World indoor theme park is one of the largest indoor amusement parks in the world, and ranked seventh worldwide in attendance according to the 2002 census. It is located in Sincheon-dong, Songpa-gu Seoul South Korea. Outside of Lotte world is Magic island, which is the outside amusuent park of Lotte world. Gyro drop (vertical free fall), Gyro swing, and Atlantis adventure is in there. The Magic castle is a beautiful castle, also located there. "LG, SAMSUNG AND ONLINE GAMES"
In consumer electronics, South Korea is the world's largest LCD, OLED, CRT and plasma display maker. The South Korean companies Samsung and LG are among the top three manufacturers of televisions and mobile phones. Samsung is currently the world's most valued consumer electronics brand. Korean is also known for their famous Multi-media Online Role Playing Game or MMORPGs like Ragnarok, Fly for Fun, Ran and more! The island contains the Natural World Heritage Site entitled Jeju Volcanic Island and Lava Tubes. Jeju Island is a volcanic island, dominated by Halla-san (Halla Mountain): a volcano 1,950 metres high and the highest mountain in South Korea. The most popular tourist spots on the island are Cheonjeyeon and Cheonjiyeon waterfalls, Mount Halla, Hyeobje cave, and Hyeongje island. There is a variety of leisure sports that tourists can take part in Jeju including golf, horse riding, hunting, fishing, mountain climbing, etc. Depending on the season, Jeju hosts many festivals for tourists including a penguin swimming contest in winter, cherry blossom festival in spring, the midsummer night beach festival in summer, and Jeju horse festival in autumn, among others. For most tourists, traffic to and from the island is mainly taken through Jeju International Airport and transport within the island by rental cars. Some local products are popular to tourists, including Jeju's special tile fish and mandarin oranges, aside from souvenirs and duty-free shopping. The Banpo Bridge is a major bridge in downtown Seoul over the Han River, South Korea, connecting the Seocho and Yongsan districts. Banpo Bridge is on top of Jamsu Bridge, forming a "double deck" bridge. The latter bridge has the ability to submerge under water if the water level rises. Banpo Bridge is a girder bridge and was completed in 1982. In September 2008, the landmark bridge was transformed into a gigantic rainbow fountain with nearly 10,000 LED nozzles that run along both sides, shooting out 190 tons of water per minute. Seoul mayor Oh Se-hoon praised that the bridge will further beautify the city and showcase Seoul's eco-friendliness, as the water is pumped directly from the river itself and continuously recycled. The project is the first of its kind in the world. My Internet connection is getting really slow and that’s very frustrating in my part especially for a dedicated blogger like me. I used to open multiple tabs and windows in my browser as a part of my multi-tasking activities such as surfing, blogging, downloading files, online gaming, chatting, and a whole lot more. Last night is a very horrible night for me because I can’t do anything with my PC after my browser suddenly froze and completely not responding to me. So I did all the possible steps to resolve this issue and exert all my technical knowledge and hoping that they’ll work. I did all the basic steps like Sequence Power cycling, optimizing my browser, checking my Firewall settings and more. Yes, it works for a while but after a few hours of using my computer, the Internet will freeze my browser again and it happens intermittently. I decided to contact my friend who is more techie than me to check what’s going on with my computer. After checking everything in my computer, he asked me what Internet Service plan I currently have so I told him that I’m registered under a 10Mbps Service Plan. He told me that my current plan is not enough to support my multi-tasking activities and the only way to solve this issue is to upgrade my plan with a higher and much faster service. I’m also planning to change my Internet Service Provider and quit their service and look for another ISP that will give me the best Internet Service Experience. I am happy to discovered charter ultra fast 60 Mbps Service which is using a new phatband technology and dubbed as one of the fastest Internet Speed in US. I would love to have this service but sad to say, the service is currently available only in St. Louis but they are spreading their service and it’s now available in Southern California too. Ultra 60 has been rolling out to other areas also along with other high-speed products throughout 2009. I hope this service will reach my area so soon. Well, we know the power of the advanced technology right? And it is possible that this service will grow and expand virally and will become available in the global market. I’m tired of dealing with my ISP and the very slow connection it provides and that’s why I’m very excited to have this Internet Service. If you are interested about this Charter Ultra fast 60 Mbps Service and want to know more about this new phatband technology, just visit their site and see what the site has to offer! Blast fishing or dynamite fishing describes the practice of using dynamite, homemade bombs or other explosives to stun or kill schools of fish for easy collection. 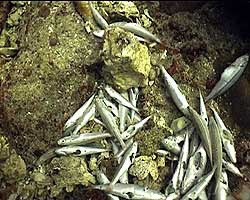 This practice can be extremely destructive to the surrounding ecosystem, as the shockwaves often destroy the underlying habitat (such as coral reefs close to a coastline) that supports the fish. The frequently improvised nature of the explosives used also means danger for the fishermen as well, with accidents and injuries. Although outlawed, the practice remains widespread in Southeast Asia, as well as in the Aegean Sea and coastal Africa. In the Philippines, where the practice is well documented, blast fishing dates back to even before the First World War, as this activity is mentioned by Ernst Jünger in his book Storm of Steel. One 1999 report estimated that some 70,000 fishermen (12% of the nation's total number) engage in the practice today. Extensive hard-to-patrol coastlines; the lure of lucrative, easy catches; and in some cases outright apathy or corruption on the part of local officials make enforcement of blast fishing bans an ongoing challenge for authorities. Blast fishing is a dangerous (and generally illegal) form of fishing. Home-made explosives made from artificial fertilizers mixed with kerosene is often employed. These devices explode without warning, and have been known to injure or kill the person using them, or innocent bystanders. M-80 fireworks are sometimes used as well. Blast Fishing is sometimes called "Redneck Fishing"
Mining is the extraction of valuable minerals or other geological materials from the earth, usually (but not always) from an ore body, vein, or (coal) seam. Materials recovered by mining include bauxite, coal, copper, gold, silver, diamonds, iron, precious metals, lead, limestone, nickel, phosphate, oil shale, rock salt, tin, uranium, and molybdenum. Any material that cannot be grown from agricultural processes, or created artificially in a laboratory or factory, is usually mined. Mining in a wider sense can also include extraction of petroleum, natural ga s, and even water. 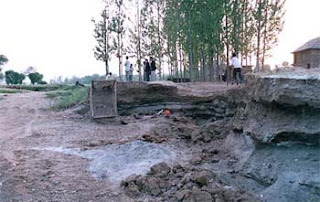 One of the serious negative consequences of the People's Republic of China's rapid industrial development has been increased pollution and degradation of natural resources. A 1998 World Health Organization report on air quality in 272 cities worldwide concluded that seven of the world's 10 most polluted cities were in China. Rapid industrialisation in the Pearl River Delta has also contributed to worsening air pollution in Hong Kong.China's increasingly polluted environment is largely a result of the country's rapid development and consequently a large increase in primary energy consumption, which is almost entirely produced by burning coal. China has pursued a development model which prioritises exports-led growth (s imilar to many other East Asian countries), by expediting increases in manufacturing capacity, largely in the absence of any significant ecological or pollution controls to reduce polluting emissions from the nation's rapidly industrialising economy. With regard to biological resources China has developed a Biodiversity Action Plan to address protection of vulnerable species and productive habitats.Various studies estimate pollution costs the Chinese economy about 7-10% of GDP each year.Since 2002, the number of complaints to the environmental authorities has increased by 30% every year, reaching 600,000 in 2004; while the number of mass protests caused by environmental issues has grown by 29% every year. 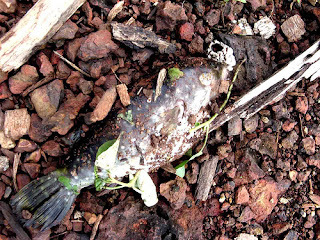 The PRC's leaders are increasingly paying attention to the country's severe environmental problems. In March 1998, the State Environmental Protection Administration (SEPA) was officially upgraded to a ministry-level agency, reflecting the growing importance the PRC Government places on environmental protection. In recent years, the PRC has strengthened its environmental legislation and made some progress in stemming environmental deterioration. In 1999, the PRC invested more than one percent of GDP in environmental protection, a proportion that will likely increase in coming years. During the 10th 5-Year Plan, the PRC plans to reduce total emissions by 10%. Beijing in particular is investing heavily in pollution control as part of its campaign to host a successful Olympiad in 2008. Some cities have seen improvement in air quality in recent years. Illegal logging is a pervasive problem, causing enormous damage to forests, to local comm unities and to the economies of producer countries. And since the EU is one of the largest importers of timber and forest products, the consumption of the member states continues to fuel illegal logging and related criminal activities. Yet the EU still has no legal means to halt the import of illegally sourced forest products.All the main EU institutions have recognized this problem; however, insufficient action is being taken to address this issue. This report aims to outline what we believe can and should be done to implement effective solutions that governments and other stakeholders can act on. To date, approximately 80 per cent of the Earth's forests have been cut down. The remaining 20 per cent are concentrated in the Amazon Basin, South-East Asia, Central Africa and the Russian Federation. 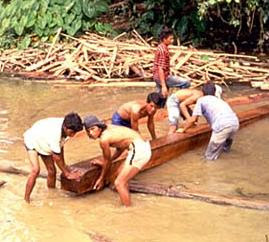 Although there is debate on whether any type of logging is good, legal logging endeavours to be sustainable and limited. Companies logging legally operate with a license, pay the government of the producer-country their rightful export taxes and are obliged to plant a tree for every tree they log. Illegal logging on the other hand is unsustainable and in most cases companies, whether national or not, log over their allowed quota, process logs without a licence and export wood without paying export duties. Extensive floods in Indonesia during early 2002 have killed hundreds of people, destroyed thousands of homes, damaged thousands of hectares of rice paddy fields, and inundated Indonesian insurance companies with flood-related claims. Rampant deforestation, much of it from illegal logging, has destroyed forests that stabilize soils and regulate river flow, causing record floods and landslides.In just 50 years, Indonesia's total forest cover fell from 162 million hectares to 98 million. 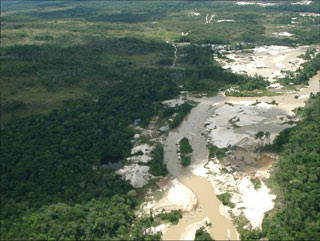 Roads and development fragment over half of the remaining forests. More than 16 million people depend on fresh water from Indonesia's 15 largest watersheds, which between 1985 and 1997 lost at least 20 percent of their forest cover. Loggers have cleared almost all the biologically diverse lowland tropical forests off Sulawesi, and if current trends continue, such forests will be gone from Sumatra in 2005 and Kalimantan by 2010. Air pollution is a mixture of solid particles and gases in the air. Car emissions, chemicals from factories, dust, pollen and mold spores may be suspended as particles. Ozone , a gas, is a major part of air pollution in cities. When ozone forms air pollution, it's also called smog. Some air pollutants are poisonous. Inhaling them can increase the chance you'll have health problems. People with heart or lung disease, older adults and children are at greater risk from air pollution. Air pollution isn't just outside – the air inside buildings can also be polluted and affect your health. Worldwide air pollution is responsible for large numbers of deaths and cases of respiratory diseases. While major stationary sources are often identified with air pollution, the greatest sources of emissions is actually mobile sources, mainly automobiles. Gases such as carbon dioxide. 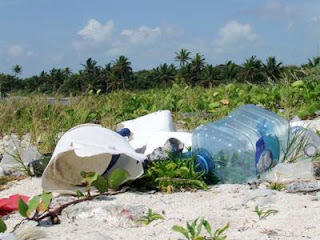 which contribute to global warming, have recently gained recognition as pollutants by some scientists. The World Health Organitation states that 4.6 million people die each year from causes directly attributable to air pollution. Many of these mortalities are attributable to indoor and outdoor pollution. Worldwide more deaths per year are linked to air pollution than to aotomobile accidents. Published in 2005 suggests that 310,000 Europeans die from air pollution annually. Direct causes of air pollution related deaths include aggravated asthma, bronchitis, emphysema, lung and heart diseases, and respiratory allergies. TheUS EPA estimates that a proposed set of changes in diesel engine technology (Tier 2) could result in 12,000 fewer premature mortalities, 15,000 fewer heart attacks, 6,000 fewer emergency room visits by children with asthma, and 8,900 fewer respiratory-related hospital admissions each year in the United States. The worst short term civilian pollution crisis in India was the 1984 Bhopal Disaster. Leaked industrial vapors from the Union Carbide factory, belonging to Union Carbide, In formed over in c., U.S.A., killed more than 2,000 people outright and injured anywhere from 150,000 to 600,000 others, some 6,000 of whom would later die from their injuries. The United Kingdom suffered its worst air pollution event when the December 4th Great Smog of 1952London. In six days more than 4,000 died, and 8,000 more died within the following months. An accidental leak of anthrax spores from a biological warfare laboratory in the former USSR1979 near Sverdlovsk is believed to have been the cause of hundreds of civilian deaths. The worst single incident of air pollution to occur in the United States of America occurred in Donora, Pennsylvania in late October, 1948, when 20 people died and over 7,000 were injured. The health effects caused by air pollutants may range from subtle biochemical and physiological changes to difficulty in breathing, wheezing, coughing and aggravation of existing respiratory and cardiac conditions. These effects can result in increased medication use, increased doctor or emergency room visits, more hospital admissions and premature death. The human health effects of poor air quality are far reaching, but principally affect the body's respiratory system and the cardiovascular system. Individual reactions to air pollutants depend on the type of pollutant a person is exposed to, the degree of exposure, the individual's health status and genetics. People who exercise outdoors, for example, on hot, smoggy days increase their exposure to pollutants in the air.